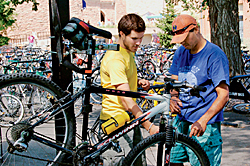 CU students are devoted to their bicycles. Since creating the first student-directed recycling center in 1970, the University of Colorado has demonstrated an unwavering dedication to environmental stewardship. The role of alternative transportation is a crucial component of the school's ongoing ecofriendly mentality. Jessica Letchford tends to Yale's market garden. It's Friday afternoon, the sun is shining, classes are done for the week, and a group of Yale students are heading off campus to...turn compost and weed vegetable plots? Yale's market garden is one of many ways the university demonstrates its commitment to providing sustainable food. The one-acre plot produces more than 300 varieties of fruits, vegetables, and flowers to be sold locally or used at on-campus events. The most visible effect is, not surprisingly, in the dining halls: Up to 49 percent of the food served is local, seasonal, or organic, according to Rafi Taherian, Yale Dining Services executive director. "Over the years, President [Richard] Levin has led the university's support for sustainability," Taherian said. "Frankly, we believe the non-altered food products are the healthiest way to go." This has not gone unnoticed by students, who overwhelmingly support Yale's efforts to serve ecofriendly food--although some complain that it costs too much and lacks variety. Franklin Jacoby and College of the Atlantic's new, eco-conscious heating plant. At Maine's College of the Atlantic, conserving energy is simply an unobtrusive part of campus life. More than 90 percent of the lighting, for example, is compact fluorescent; the only reminder is the characteristic flicker as they stutter on. What little electricity the school does use is renewable, and COA buys carbon offsets for nonrenewable energy sources such as vehicle fuel. Such everyday conservation practices are an expression of the COA culture. 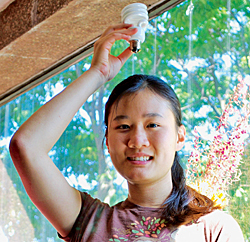 Justine Chow thinks Harvard has some bright ideas about saving energy. Harvard's centuries-old Yard now boasts modern moisture-sensing sprinklers that prevent overwatering and keep its grass as green as the school's efficiency practices. With compact-fluorescent bulbs in nearly every light fixture, solar panels on rooftops, and 17 LEED-certified buildings, Harvard leads the nation's universities in using resources efficiently. Although many students do not fully appreciate the implications of LEED certification, the label "at least gives them a sense that these buildings are built to be more energy-efficient," said junior Molly Bales, a representative of the school's Environmental Action Committee, which focuses on student-run sustainability projects. With recent budget cuts affecting all aspects of university life, it helps that Harvard's officials see planet-friendly actions as solutions rather than luxuries. "Energy efficiency and greenhouse-gas reductions track nicely," said Jay Phillips, Harvard's director of energy, sustainability, and infrastructure. "So we often save money as we reduce our emissions." 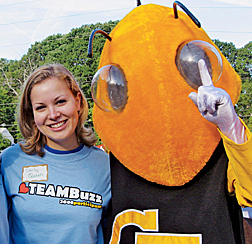 Carly Queen and her bug-eyed friend are abuzz about Georgia Tech's eco-conscious curriculum. While earning my B.S. 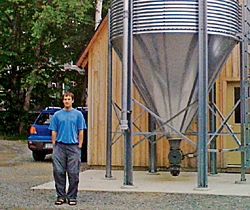 in mechanical engineering at Georgia Tech, I took courses about renewable energy and sustainable technologies, including classes such as Environmental Ethics, and Fuel Cells, Sustainability, and Renewable Energy Systems. The curricula covered topics ranging from wind-turbine design and performance to the racial and class discrimination inherent in environmental decision-making. I completed my degree with a solid foundation in the principles of renewable-energy generation and a profound understanding of the many challenges we must overcome to create a more sustainable world. During my five years at Georgia Tech, I witnessed an increasing acceptance of greener practices. The first clue was a proliferation of lectures, documentaries, discussions, and other events focused on planetary responsibility. There were opportunities to learn about environmental policy from Nobel Prize winners and to see firsthand the effects of water privatization and mountaintop-removal mining. Students participated in projects to improve recycling bins, make jewelry from waste, and study the environmental impact of vegetarianism. 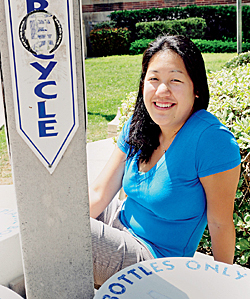 Audrey Kuo appreciating one of the many recycling centers on Bruin Walk. The red-brick buildings at UCLA may seem quintessentially collegiate if only because the campus so often doubles for other universities in Hollywood's ever-popular college films. Rarely depicted in those movies, though, are the markers of UCLA's sustainability efforts: Classroom trash cans encourage students to separate mixed and white paper for recycling; food courts offer biodegradable utensils; and Bruin Walk, UCLA's main thoroughfare, is dotted with bins for discarding glass, plastic, and aluminum. Last November, alumna Nurit Katz became the university's first sustainability coordinator. Along with implementing energy-efficiency efforts and a climate-action plan to reduce UCLA's greenhouse-gas emissions to 1990 levels by 2020, Katz oversees the university's stellar waste-management efforts. These include recycling materials from construction projects, recovering water from labs and air-conditioning systems, and composting food waste from cafeterias--all of which reduce waste by more than 1,500 tons each month.